The Joint Strike Fighter program started with a set of requirements for a tactical fighter that would meet the operational needs of the US Air Force, US Navy, and US Marine Corps using an airframe that maximized the number of common parts and thereby reduce development and maintenance costs. As with any ambitious program like this, the devil is in the details and as the program evolved, challenges arose. The first step in the program was to determine the best overall design and Boeing developed the X-32 that had, shall we say, a rather unique appearance. Lockheed Martin countered with the X-35 and this design would ultimately prevail. This victory made Lockheed Martin the only US company to produce the only two Generation Five fighters in US service - the F-22 Raptor and the F-35 Lightning II. As development continued on the F-35, it became clear that the operational differences between the military services was going to pose a greater engineering challenge than originally thought. The F-35A for the USAF was straightforward and didn't pose any great challenges, but of course the facility producing the F-35 also produces the F-16 Fighting Falcon which the F-35 will eventually replace. The F-35C for the US Navy was going to be more difficult as it would need larger wings and horizontal stabilators for better low-speed performance getting on and off the deck of aircraft carriers. The larger wings mean folding wings which also means more weight and complexity (anyone remembering the F/A-18 Hornet early development will remember these wing challenges). Even now, the all-important arresting hook for the aircraft is still not reliably 'trapping' the aircraft on landing (catching the arresting gear) but this bug will soon be fixed. 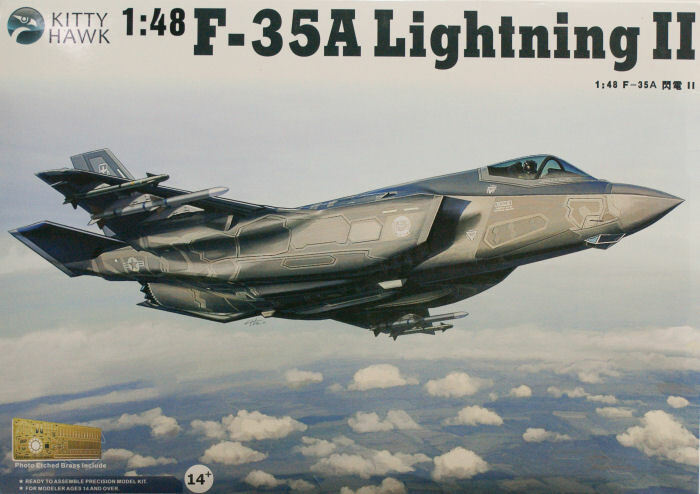 Kitty Hawk Models has produced the first kit of the production F-35A in any scale (less than 1:1) and the second true kit of the production F-35 series as well. You'll recall that Panda Models released their 'F-35' in 1/48 scale roughly ten years ago ( look here) but this was based on the X-35 airframe with some educated guesses to fill in some missing details. DML released the F-35A in 1/144 about four years ago but it still looked more like an X-35. This kit shares many of the same parts trees as the F-35B (and why not, the full-scale aircraft share many common parts) and inclusion of the external stores pylons is a real plus though the instructions don't show these used in this version. The instructions do show JDAMs in the weapons bays as well as the AIM-120Bs. The kit canopy is clear and it is tinted on the full-scale aircraft, Check your references but you can simply apply a light coat of Tamiya Clear Smoke to get that look on the kit part. One area of concern is with the instructions. 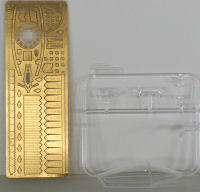 The assembly steps are well-illustrated but the assembly steps don't provide colors for the cockpit or other visible details not shown in the final color profiles. With a little online searching, you can determine the colors for yourself, but it would have been easy enough to have these on the instruction sheet as you work through the project. Another problem discovered in our quick-build of the F-35B was the mating points between the fuselage and wings. These were female on female (no snickering please) and required some hasty engineering to get the wings on the aircraft. Now that we've seen how this goes together, it is a simple matter of using alternating tabs made from cut strips of styrene stock alternated between the wing and fuselage to dovetail the wings to the fuselage and assure a solid join. This is the first fighter in some time that won't have either the ACES II nor Naval ACES (NACES) ejection seat. The Martin Baker Mk.16E was selected though it was interesting to see even the light-weight and very capable Russian K-36D under consideration at one time. This is also the first fighter since before World War II that doesn't have a heads-up display (HUD) or gunsight atop the instrument panel. This capability is now built into the pilot's helmet as part of his/her augmented reality displays projected into the visor. The aircraft is intended to be flown without pylons to maintain its 'stealth' capability similar to the F-22, but like the F-22, this aircraft can use pylons to provide additional fuel and weapons stores when stealth is not required. The decal sheets also provide markings options for Australia, Belgium, Canada, Denmark, Israel, Italy, Japan, Netherlands, Norway, South Korea, Turkey, and United Kingdom in case you want to render what one of these aircraft will look like in their service. This kit captures a lot of details that haven't been seen in kit form before. I saw the prototype for the 1/32 scale F-35 from Lindberg/Hawk several years ago and it wasn't this nice. While it is a shame that no bombs aside from the pair of JDAMS, nor provisions for internal weapons suspension are included in the kit, this is common in many Hasegawa and other kits as well. What we have here is the first kit of the F-35A and I sincerely hope that Kitty Hawk Models will produce the F-35C variant as well. My sincere thanks to Kitty Hawk Models for this review sample!